Joey's Mediterranean Grill on Broadway and Granville in Vancouver claims to be the place where atmosphere melds with hip comfort. A large dining area with plush furniture and fittings and a trendy bar area with booths and bar tables could definitely be classed as "hip comfort". However, Joey's seems like a place you go to be seen. The atmosphere (and staff) are trying to project a level of cool that transcends the dining experience. 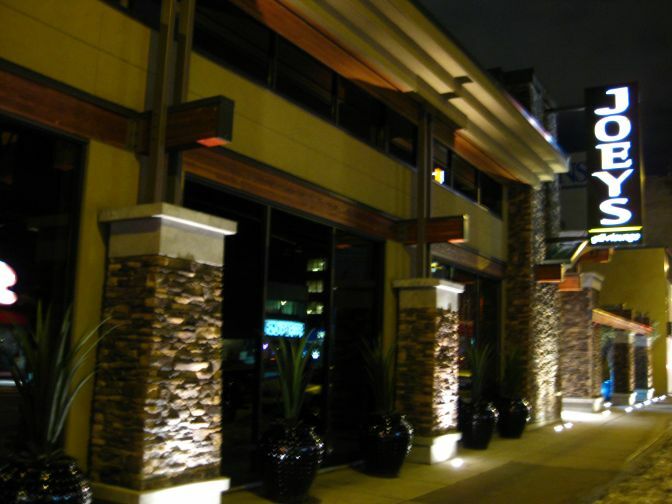 Having said this, visitors should not feel intimidated by the lush surrounds because Joey's Mediterranean Grill is basically a replica of such establishments as the Cactus Club, with a little more class. The name is a moderately confusing given that nothing on the menu vaguely resembles what might come off a Mediterranean Grill, but it is tasty none-the-less. It's certainly not 5-star cuisine, but it is both filling and well-rounded. The wine and drinks list is also well-rounded, with anything from cocktails and martinis to a freshly pulled beer to wash down your burger or appetisers. Staff are friendly and efficient, though like the Cactus Club it seems Joey's might be focusing more on cup size and cleavage than intelligence and experience. Joey's is a no-brainer for after-work drinks or an upmarket working lunch. It is most certainly not a romantic hot spot, nor somewhere you could envisage dropping into for a quick bite to eat, but it certainly serves a purpose. Joey's Mediterranean Grill is at 1424 West Broadway, right near Granville Street. Phone 604 732 5639.